The SquadUP product team is at it again. Even in the midst of building our mobile app (coming soon, to an iPhone near you) they’re still able to use customer feedback to make improvements to the platform. That’s probably one of their favorite parts of startup life: the ability to connect with users, learn from their experiences, and adapt quickly. 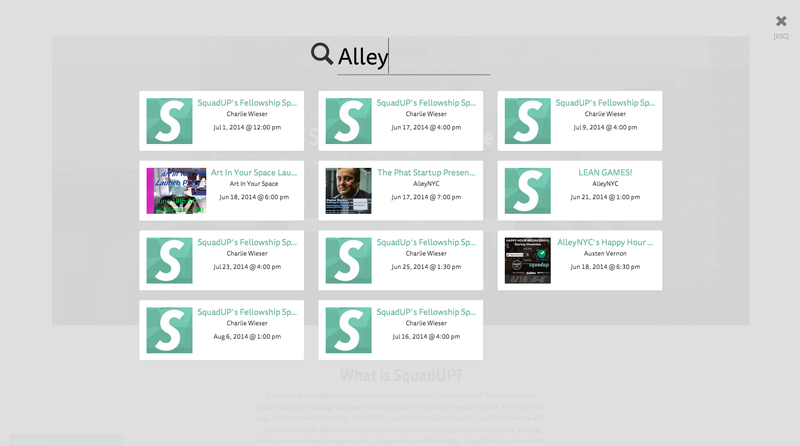 Head to squadup.com and you’ll notice the homepage is a little different. We now have a search bar, front and center. You can now search through public events based on the name of the event, the host, interests, or location. If you know the name of the event or host you’re looking for then that’s easy. If you’re friends with the host on Facebook, or even friends with an attendee, those events will show up in your upcoming events anyway. But what if you’re not? We have you covered. Simply type the name of the event or the host into the search bar and you’ll find exactly what you’re looking for. If you’re looking for a specific type of event, like a concert or a tech conference, type that in and see what happens. Every event has a myriad of tags that help form its event identify. For example, let’s take the graduation party we highlighted a few weeks back. You could search by the name of the school, the city it’s located in, or even just words that describe the event like “college,” “graduation,” or “party”. But what if you don’t want random people seeing your event page? Don’t worry, our product team is thorough and has thought through every possible concern. When creating an event, hosts have privacy options including the choice to make the event public and searchable by anyone. If you’re in a busy market like NYC, this will help you sell tickets. Want more people to attend your charity’s fundraiser? Give people searching for fundraisers the chance to discover your awesome event. What do you think of our search feature? And more importantly, what feature would you like to see next? Leave us a comment or tweet @squadup.